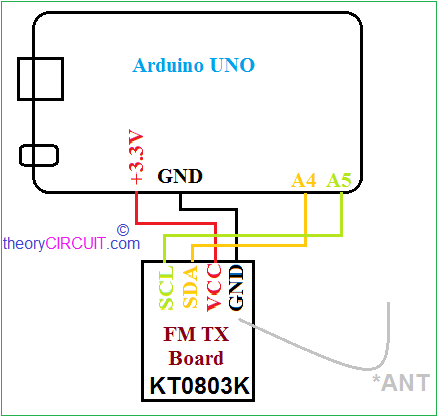 FM Transmitter made out with KT0803K based board and it is controlled by famous Arduino UNO board. It transmits our voice through Frequency Modulation between 70MHz to 108MHz.Monolithic Digital Stereo FM transmitter IC KT0803K from KTMicro capable of producing 70 MHz – 108 MHz standard FM with Ultra..
FM Transmitter made out with KT0803K based board and it is controlled by famous Arduino UNO board. It transmits our voice through Frequency Modulation between 70MHz to 108MHz. Monolithic Digital Stereo FM transmitter IC KT0803K from KTMicro capable of producing 70 MHz – 108 MHz standard FM with Ultra low power consumption 17mA operation current from single power supply. By using I2C wires (SDA, SCL) Micro controller Unit can decide the channel frequency and control the KT0803K as a slave. This IC contains on chip 20-bit Audio ADC to convert Left in, Right in audio into digital signal. On chip DSP core is well enough to handle the digital audio signals. FM modulator output is Amplified by RF power amplifier and bring out to antenna through RF out pin. This IC comes in 16-pin SOP package, operating voltage varies between 1.6 V to 3.6 V and compatible IC for programmable FM transmission. FM transmitter module from elechouse, this board contains monolithic digital stereo FM transmitter IC KT0803K which is responsible to make FM over our Audio input and this IC directly controllable by Arduino board (Microntrollers) through I2C interface. Stereo input jack given for audio input from external device and also this module has on-board mic to pickup our voice. Audio signal from the mic amplified through 9013 npn transistor and applied to the tx IC. 32.768 K Crystal provides clock to this module. By two wire standard I2C-Microcontrollers can control this FM module and KT0803K requires no external tuning. Here Vcc pin of module connected to Arduino’s 3.3V power supply pin, and Ground is connected to GND of Arduino board. I2C Pins SDA and SCL connected to A4 and A5 of arduino uno board because these two are I2C pins in uno board. It change depends on types of arduino board and micro controllers, check the pin details if other board is used. (eg:if you want to set FM 95.6MHz,then input &0956 and send). and 108Mhz. For example,  &756 is 75.6MHz, and &666 is out of range. This code requires Library file, you can get it here.